Some people are born with the natural ability to pick out quality show livestock. Others develop the talent over time. Regardless of your current skill level, one thing that can help young livestock exhibitors trying to pick out their next show lamb prospect is to find out what the lamb’s parents look like and what past winners those genetics have produced. “The key is to ask the breeder to see that lamb’s mom and to possibly see that lamb’s dad while you are there on the farm, get as much information as you can about those pedigrees, study those pedigrees and find out what those bloodlines have produced in the past. A lot of predictability is based on past performance – ask about the mom’s track record,” said Sam Silvers, BioZyme® Inc., Area Sales Manager in West Texas. Silvers has raised and placed numerous winning lambs for exhibitors at the Texas majors and across the U.S.
After you know the past performance of the lamb’s sire and dam, Silvers offers advice on three phenotypic factors an exhibitor should look for in a prospective show lamb. Structure. Make sure the lambs are level hipped and run up hill. As for neck placement, make sure they have a smooth shoulder, and their neck comes out of their blades right. Make sure they are correct on their feet and legs; they should not toe in or toe out or hock in or hock out. Structure – as for most species – needs to be of upmost importance. “Take time and look at them. If there is one you are really interested in, ask the breeder to put it in a separate pen by itself to make sure there are no structural issues. It is hard to evaluate structure in a pen of 50 lambs or when they set it up on a profile,” Silvers said. Muscling. Although it can be challenging to look for muscle when lambs are so little, you can still get an idea of muscle shape and mass from their rack shape. Is there a groove running down its back? That is a good indicator of muscle shape. Silvers said one of the biggest indicators of future muscle is from the size and shape of the lamb’s forearm. He also encourages prospective buyers to handle the lamb over its rack, loin and through its leg, to gauge muscle. Especially if you are at a sale, handling is a good way to determine true muscle versus condition, as some consignors like to add extra “bloom” to make sure their lambs look their best on sale day. Although you don’t want a lamb that is too green, buying one early on that is heavy in its finish is not good either. Bone. In the show ring, it is important to make sure that lambs are heavy-boned and stand on a big foot. Bone can also be an indicator of future growth and performance. Once you know the past performance of the lamb’s parents, and have evaluated structure, muscling and bone, Silvers said there are just a few more things to look for when selecting your show lamb prospect. Make sure the lamb is not overly parrot-mouthed or has issues with coccidia or pinkeye. It is always best to have open dialogue with the breeder you are buying lambs from. Ask if the lamb is current on its shots for deworming, overeating, tetanus and if it has been treated for cocci. Finally, Silvers reminds lamb shoppers to have a budget and stick to a budget that is in-line with the goals established. He said there is no need to go over budget for any show. “There’s a lot of sheep out there. If the first one you like is not within your budget or your means, go somewhere else. Or ask that breeder if they have something within your budget. Find a breeder that you feel comfortable with that is willing to work with you,” Silvers said. Now that you’ve selected and purchased your show lamb projects and brought them into your barn, it’s time to start working on a nutrition management plan. To get them started right, you want to keep them eating and drinking every day. Once you get your show lambs home, introduce them to Vita Charge® Liquid Boost® in their water. Liquid Boost supports digestive health and promotes feed and water intake during times of stress and recovery. It contains Amaferm®, a precision-based prebiotic that is research-proven to combat stress by supporting the animal’s own immune system, significantly increasing intake and nutrient utilization. Liquid Boost can be added to water or mixed in with feed. It’s also a good idea to give them a dose of Vita Charge Paste, even before you haul them to your barn, as a way to help them cope with the stress of transportation and a change in their environment. 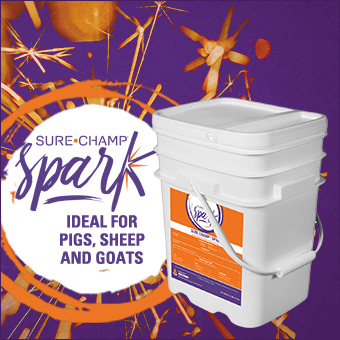 Another way to make sure your lambs get the Amaferm advantage every day is to add Sure Champ® Spark® to their diet. 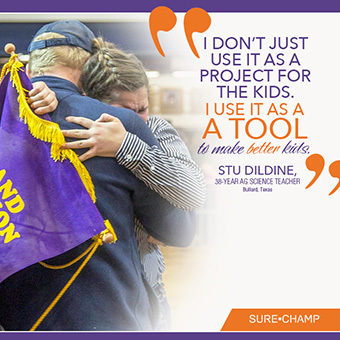 Sure Champ Spark is a pelleted supplement that continues to drive appetite. Both the Sure Champ and Vita Charge Liquid Boost also contain MOS to trap bad bacteria, limiting their ability to do harm to the gut. And, when temperatures start to warm up this summer, Sure Champ has created Sure Champ Extreme with Climate Control. It also contains Amaferm and MOS, but has a unique ingredient to help maintain circulation to support animal performance in extreme temperatures. The past may be a really good predictor for future performance, but with each generation, the competition gets tougher. Get the competitive edge by giving your lambs the Amaferm advantage with products like Vita Charge and Sure Champ. You’ll be on your way to #preptowin if you make sure your lambs get Sure Champ. EVERY. DAY.